Volunteers are truly a special group of people who give from the heart to help make residents lives a little brighter each day. Volunteers bring joy and enthusiasm to the long term care facility, combining a sense of commitment with love for residents. They have our gratitude, and we urge anyone with a sense of responsibility to become a volunteer to share their love, input and caring with long-term care residents. 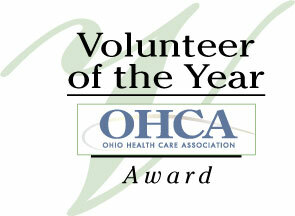 The Association's Awards program recognizes those volunteers who have made extraordinary efforts in their volunteer roles. The winners are selected by a committee of long-term care professionals from nominees submitted by member facilities across the state. Linda Douglas and the Ripley-Union-Lewis-Huntington (RULH) National Honor Society (NHS) student volunteers have been regularly donating their time and talents to Ohio Valley Manor for more than 3 years. They are the first people called to assist with the facility's special community events, including OVM' s Holiday Open House and Easter Egg Hunt. The students regularly visit one-on-one with residents, deliver Valentines and Christmas cards, and assist in the transportation of residents for activities throughout the building. Linda Douglas, the NHS chapter advisor for RULH, collaborated with OVM to form a program that is truly beneficial to the residents and students alike. By developing relationships with their "adopted grandmothers and grandfathers," this group of volunteers helps reduce the isolation and loneliness that can impact residents. Because of their youth and energy, they engage with the OVM residents in a unique and meaningful way. The group usually volunteers after school or on weekends. While they most often visit together, many of the students have taken the initiative to stop in and help out when they have spare time, and have become a regular sight at Ohio Valley Manor. Thanks to the vision of Linda Douglas, OVM' s Volunteer team has more than doubled and several new faces join the ranks every September. This is truly a group of volunteers worthy of the 2019 Award! Living just minutes from the Villa St. Joseph Campus, Josephine is a true fixture recognized by residents and staff for her presence. She often visits at short notice to help the staff and support a program or event. For more than 6 years, Josephine has helped the Villa's Life Enrichment Department implement a program that provides weekly manicures to residents, and involves other community volunteers in support of the effort. Ignoring her 88 years of life, "JoJo" can be found stacking chairs at the end of a concert, even after being out of breath seating everyone for a "Singing Angels" concert. Each Easter, Thanksgiving and Christmas, the Villa hosts a resident and family dinner. Josephine funds tickets for 14 Sisters to attend, further demonstrating her strong devotion to the Sisters and Villa St. Joseph. Usually quick with a meaningful saying or quote, Josephine found herself a bit tongue-tied when she was named Volunteer of the Year at the Villa several years ago. She usually tells people to stay busy and take each day at a time, and that advice has served JoJo well, earning her the OHCA 2019 Adult Volunteer Award! Isabella is a special volunteer who takes amazing initiative for someone who just turned 16. She began her adventure as a volunteer visiting at Ganzhorn Suites, and she fell in love with the smiles and companionship of the residents. Isabella is seen as everyone's granddaughter, and residents can't wait to interact with her. Her passion for those on the memory-loss journey has been a gift, and she works independently and continues to discover new ways to help residents keep connected to the things they loved in their lifetime. Isabella is committed to creating moments of joy for residents, modifying activities when needed so that everyone will be successful. She creates programming on her own, and she has become quite close with many of her special friends while working with them. When a resident is in distress, Isabella is there to redirect the conversation to help them into a better emotional place. Even when they don't remember Isabella's name, the smiles, laughter and joy on her face create an instant bond.